Inspector Moher was born in Ireland on May 24, 1864. He settled in New Hampshire and worked in the Manchester mills before joining the police force on December 24, 1898. His first beat was said to be a place frequented by the worst and toughest characters ever in Manchester. He was made Inspector on December 13, 1913. On July 2, 1921, 22-year old robbery suspect, Oscar Richard, attempted to pawn stolen jewelry in Manchester. Inspector Moher, on routine patrol of pawn shops, confronted Richard in the Puritan Loan Company and a chase ensued; first on foot and then with Inspector Moher commandeering a vehicle driven by a local resident. Richard was eventually spotted, and Inspector Moher again confronted him, this time with revolver drawn and ordered him to throw up his hands. A close-range gun battle followed, with Inspector Moher striking Richard five times. Richard died at the scene. Inspector Moher was struck twice, with a shot to the abdomen proving fatal. Inspector Moher died of shock from his wounds on July 3, 1921. He left behind a wife, Alice and 5 children; William, Elizabeth, Frances, Mary and Robert. 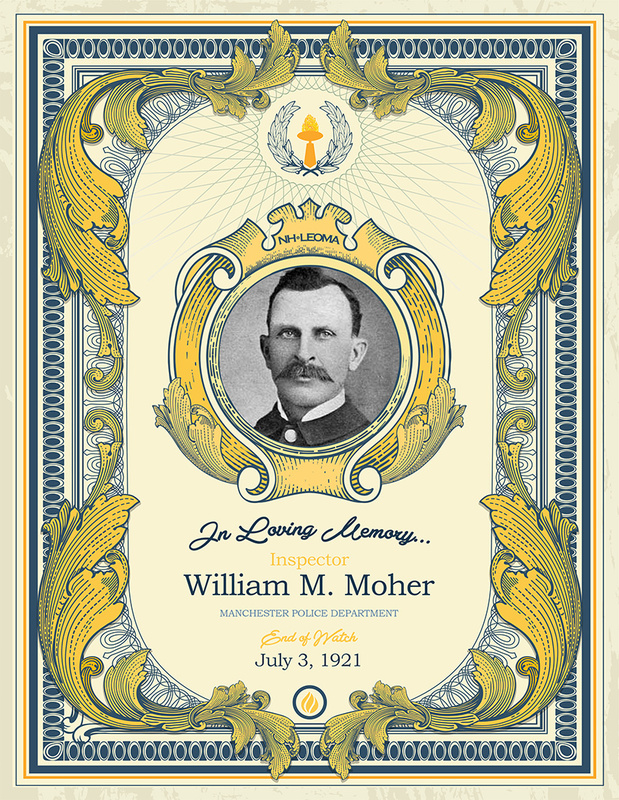 Shortly after his funeral, Inspector Moher’s son, William M. Moher, Jr. a Manchester Police patrolman, succeeded him as Inspector.